HORTON, Frank Jefferson, a Representative from New York; born in Cuero, De Witt County, Tex., December 12, 1919; attended the public schools of Baton Rouge, La. ; A.B., Louisiana State University, Baton Rouge, La., 1941; LL.B., Cornell University Law School, Ithaca, N.Y., 1947; United States Army 1941-1945; admitted to the New York bar, 1947; lawyer, private practice; active in civil defense and Boy Scout work; president of Rochester Community Baseball, Inc., 1956-1962; executive vice president of the International Baseball League, 1959-1961, and also attorney for the league; member of the city council of Rochester, 1955-1961; elected as a Republican to the Eighty-eighth and to the fourteen succeeding Congresses (January 3, 1963-January 3, 1993); not a candidate for renomination to the One Hundred Third Congress in 1992; died on August 30, 2004, in Winchester, Va.; interment in Arlington National Cemetery, Arlington, Va.
Papers: In the Judea B. Miller Correspondence, 1974, 2 items. Letters to Judea Miller from Congressman Frank Horton and Attorney General William B. Saxbe concerning remarks made by Saxbe about Jewish intellectuals. Papers: ca. 1963-1992, approximately 1,500 linear feet. The papers of Frank Jefferson Horton include legislative reference and correspondence files, general correspondence files, speeches, reports, press releases, photographs, films, and memorabilia. Horton, Frank J., Richard S. Schweiker, Garner E. Shriver, Robert T. Stafford, and Charles W. Whalen, Jr. How to End the Draft. Editorial and research assistance by Douglas L. Bailey and Stephen E. Herbits. Washington: National Press, 1967. Ralph Nader Congress Project. 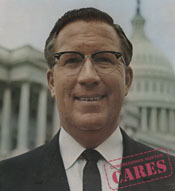 Citizens Look at Congress: Frank Horton, Republican Representative from New York. Washington, D. C.: Grossman Publishers, 1972.